Claire Kincaid has never believed. Growing up in New Orleans, she has been surrounded by voodoo all of her life. What’s more, she is the great granddaughter of Marie Laveau, the most powerful voodoo priestess in history. As if that wasn’t enough, her parents hold high ranking positions in the Guild, the body of power in the voodoo community. Still she doesn’t believe. Claire has always believed in what she can see and touch, what is explainable. She has never had any patience for voodoo magic and hexes. However, something happens to change her mind and put her in danger. A woman comes to her shop looking for a black listed substance. They are not the only shop to be visited, though, and this puts everyone on high alert. When several of the shops are broken into and whispers of the Cold Blood spell start circulating, Clare knows something has to be done. I absolutely loved every page of this book! 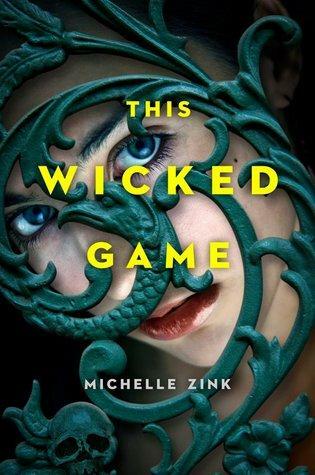 Michelle Zink always writes an amazing story with characters you will grow to love, but there are things that stand out in This Wicked Game that help the book stand out. It’s the first of Zink’s novels to be held in modern times. Her previous four novels have all involved places and times from the past. Though This Wicked Game doesn’t have the flowery Victorian dialogue, the book doesn’t suffer from this. Far from it. There’s something that makes the story in This Wicked Game more frightening and more real having it told in modern times and modern language. It also features Voodoo, something at once instantly fascinating and alluring. Zink does a magnificent job bring voodoo and New Orleans to life. It’s as if we’re right there with Claire, fighting alongside her. The other thing that works so well for This Wicked Game is a dark mystery of the novel. Her other books have featured a paranormal mystery of sorts, but this is the first time Zink has delved into full on mystery and it works so well for the novel. There are fantasy elements within the book, but they don’t over power it. The mystery is all consuming and you will want to read to the very end to find out what happens. Claire is another reason why this novel succeeds. She makes a believable progression from non-belief to believer though out the book and every emotion she goes through is pitch perfect. Her transition is so well done, so well crafted, that by the time Claire believes, we will too. Zink has outdone herself with This Wicked Game. It involves mystery, suspense, secrets from the past, betrayals and young love. It has everything you could want in a novel. I can’t wait to read it all over again.